This is a multi-functional fitness tracker. It can track your steps throughout the day and records calories and distance, helping you keep fit. 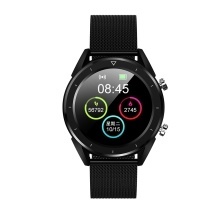 Supports monitoring heart rate, ECG, blood pressure and blood oxygen. Supports step counting, stopwatch, remote photograph, music control. Supports Alipay offline, easy to pay. Provides the data report of altitude, ultraviolet light, air pressure and weather to you (push through the network). Multiple sports modes: walking, running, cycling, swimming, hiking, basketball, badminton, table tennis, football. HD screen, easy to read all fitness data. With IP68 waterproof performance, no fear of washing hands, rain and water environment.